GHRH’s are paired specifically with GHRP’s in order to create a synergy between the peptides that will unlock the body’s own stores of growth hormone. Even though many peptides work in some capacity by themselves, it is most beneficial to run your GHRH alongside a GHRP. This is why CJC 1295 is highly desirable, and it’s one of the most widely used in the bodybuilding community. Right now, it has been debated which CJC 1295 is best to use. While MOD GRF (CJC 1295 no DAC) is commonly used with GHRP’s to increase pituitary GH pulse, more frequent injections will need to be administered. 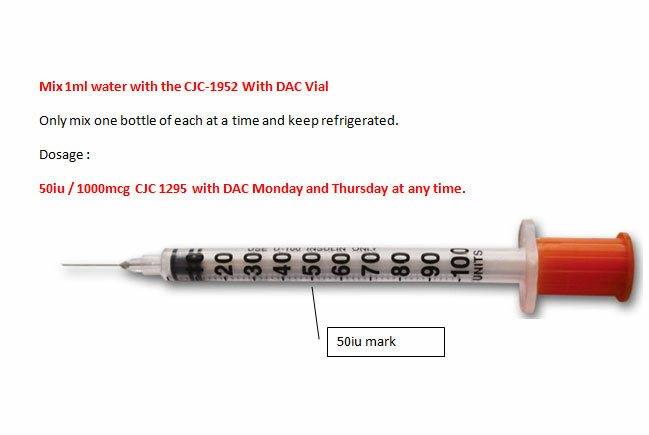 The CJC 1295 with DAC will result in a series of smaller pulses; therefore, injections will be less frequent – often two to three times a week. As I have just stated above, when a person sees the term CJC 1295 without DAC this is really means that they are looking at MOD GRF 1-29. This tetrasubstituted peptide is a modified version of the original GRF 1-29 peptide better known as Sermorelin. Due to the extreme short half life of the original GRF 1-29, chemists were able to modify the peptide to offer a longer biological activity that reduced the metabolic clearance. Although with MOD GRF 1-29 its modification had resulted in a greater peptide bond, the average user will still likely need to inject two to three times a day with a GHRP to get the maximum effectiveness for releasing endogenous growth hormone. Now when the drug affinity complex (DAC) was added to CJC 1295, it allowed for an even greater possibility to utilize smaller GH pulses (what was once thought of as a bleed) that, when combined with a GHRP, will activate growth hormone stores to release throughout the day and night. When the DAC component was added, this allowed the peptide half-life to be extended to about one week and also provided for steadier blood levels after injection. Now that we understand how important the DAC factor is, this becomes a much more viable and cost effective way to utilize CJC 1295 with DAC along with a GHRP. The DAC, when added, is able to bind to albumin that circulates the body, literally being able to last for days as it looks for receptors to bind to. So, in short, if you prefer to use shorter spikes of GH release then the use of the MOD GRF 1-29 (CJC 1295 without DAC) is going to be optimal. However, if your prefer fewer injections and still want to unleash your growth hormone stores, then 2-3 times a week injections of CJC 1295 with DAC along with your daily injection of GHRP would be the way to proceed for maximizing growth hormone release. Please note: all articles are for informational purposes only. We do not encourage intake of any synthetic peptides/nootropics listed on this site.